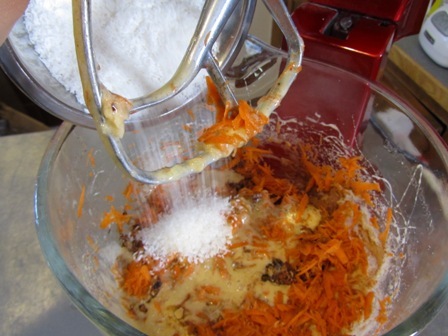 Carrot cake is best when you serve it with cream cheese frosting. It is even better when you serve it with white chocolate cream cheese icing! This recipe comes from another favourite cookbook: Rebar Modern Food Cookbook. 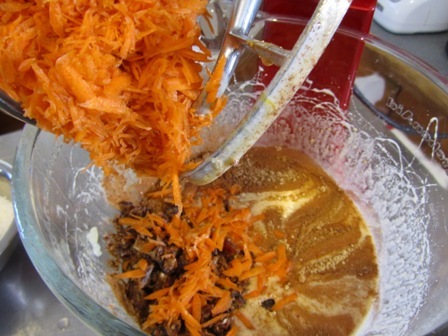 This is no ordinary carrot cake. 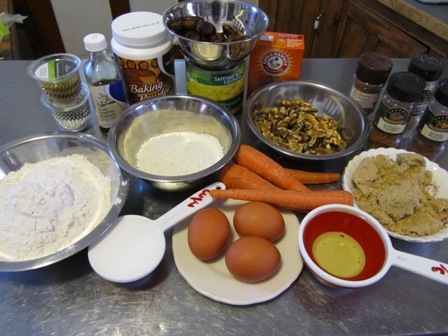 There are many additional ingredients found in this recipe. A lot of ingredients, as you can see here. It does take a lot of prep but the results are worth it. 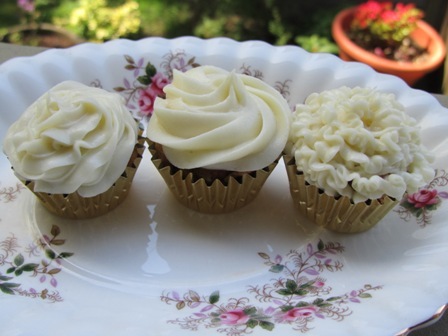 You end up with delicious not too sweet, moist cupcakes. 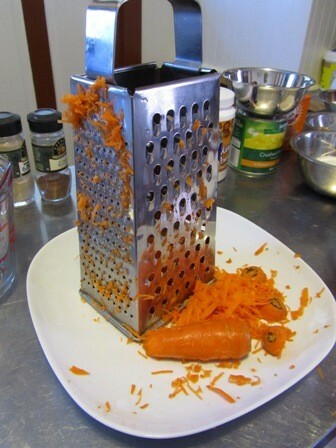 Since this carrot cake is going into tiny cupcake tins, I like to grate my carrots with the smallest setting. I grate about 3/4 at the smallest setting and 1/4 with the larger setting. This adds some texture to the cupcake. If I was going to be making a cake, I would only use the largest setting as I like to the texture it makes. 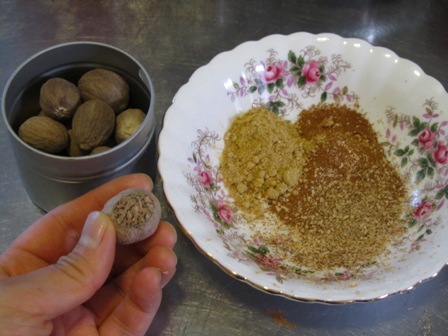 Whenever you can, use fresh nutmeg. It will enhance the flavour. 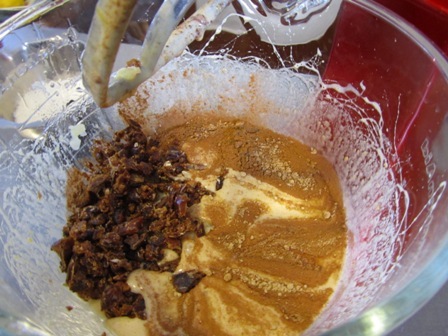 I added fresh ground nutmeg, ginger, cinnamon, and allspice to this recipe to give it a warm spicy flavour. 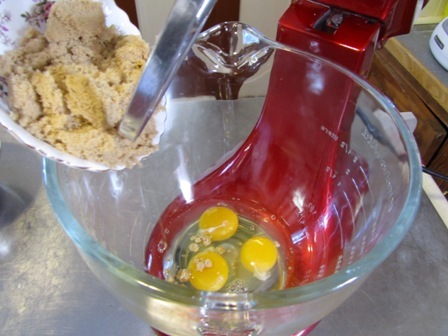 Start blending the eggs and sugar in a bowl. 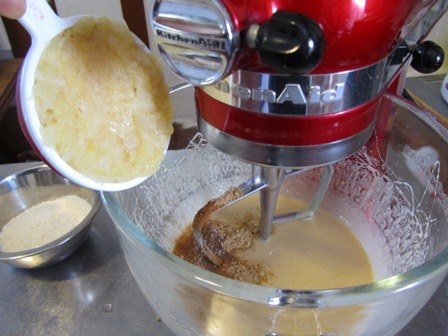 Blend until the sugar is dissolved. 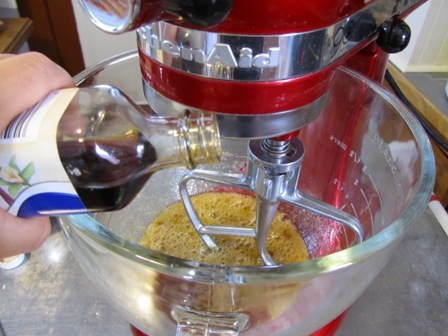 Add vanilla extract ,and oil and blend well. Finally add the spices and crushed pineapple. Make sure you drain the pineapple before using. 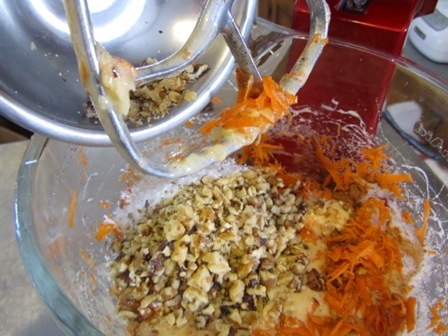 Add in the chopped dates, grated carrots, shredded coconut, and chopped walnuts. 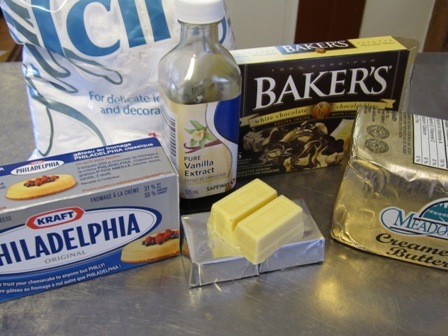 It is much easier to mix in these ingredients before you add the flour. Blend well. Now its time to add the flour. 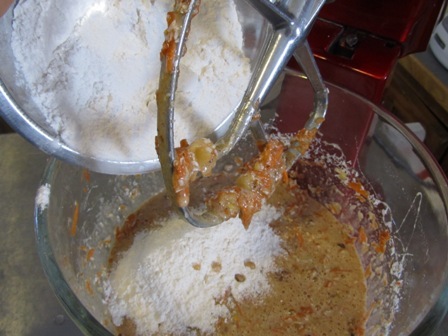 Do this a little at a time and make sure to scrape the bowl to ensure that the mixture is properly mixed. 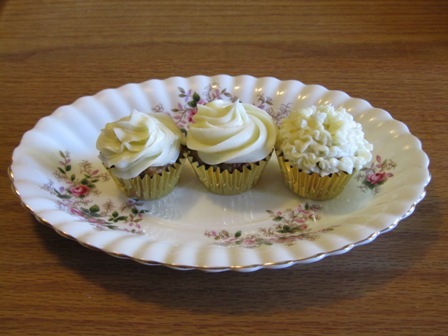 Get your mini cupcake tins ready. Portion them out. After placing the cupcakes on a cooling rack it is time to prepare the frosting. This is not any cream cheese frosting. 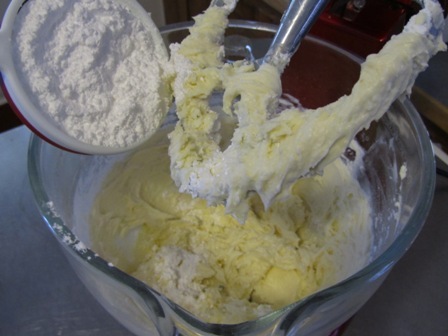 You add white chocolate to it which gives the frosting a nice soft texture. 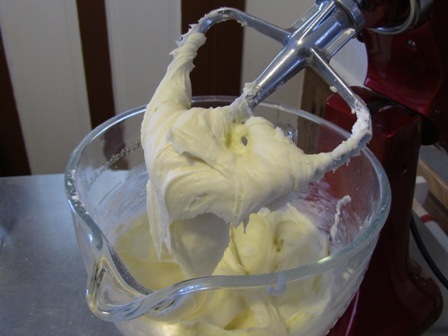 Like all cream cheese frosting recipes, start by blending the butter and cream cheese until smooth. Meanwhile, melt some white chocolate in the microwave. Watch the chocolate to make sure it doesn’t burn. Also make sure you melt the chocolate completely otherwise the chocolate gets stuck in the icing tip (I learned the hard way). Blend well. 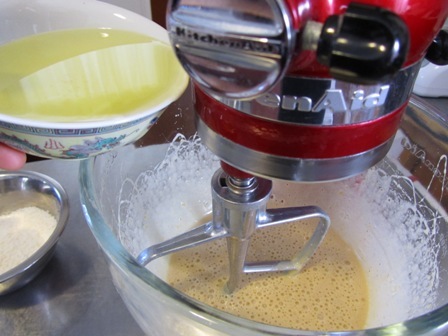 Slowly add icing sugar until you get the consistency that you want. 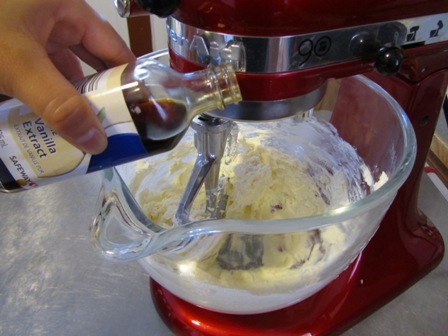 Finish by using various tips to make a wonderful assortment of cupcakes. 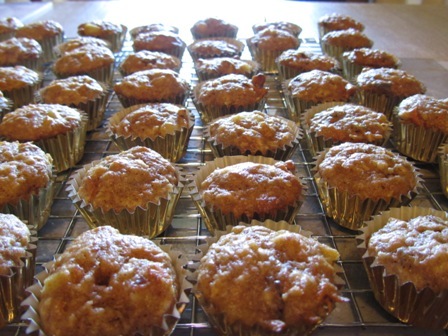 Preheat the oven to 350 Degrees F. Combine eggs and sugar until the sugar is dissolved. Add vanilla and beat until the volume has tripled. 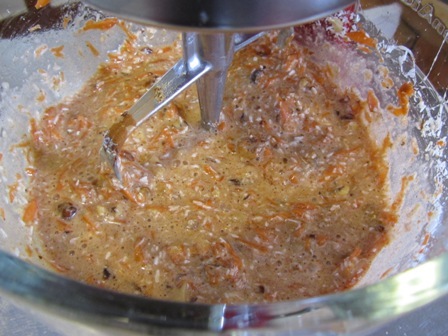 Add oil, spices, grated carrot, pineapple, coconut and walnuts to the liquid ingredients. 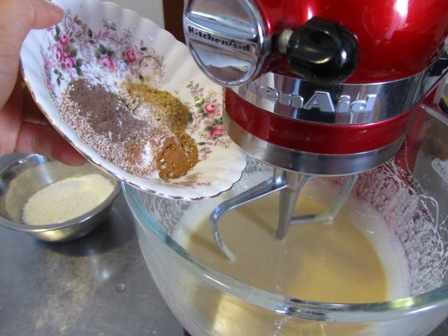 Combine all the dry ingredients into a bowl. 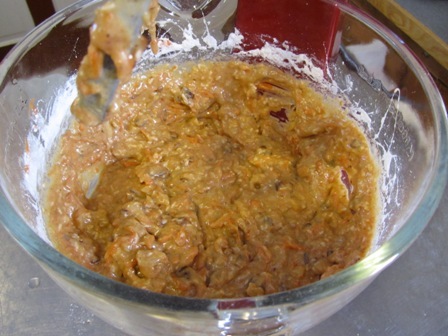 Add to the wet mixture. 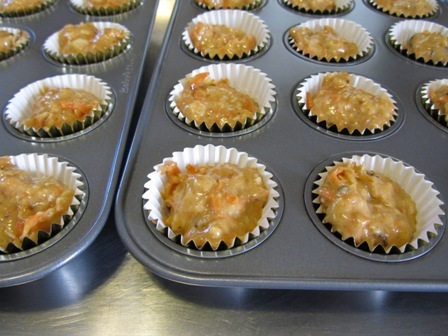 Portion into the cupcake liners. Bake for about 20 minutes. 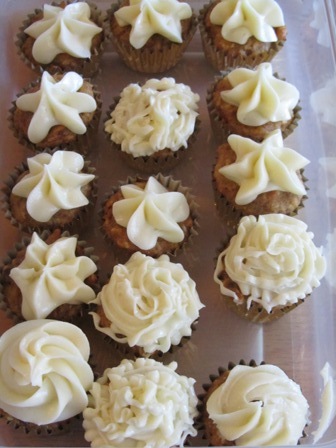 While the cupcakes are cooling, prepare the frosting. 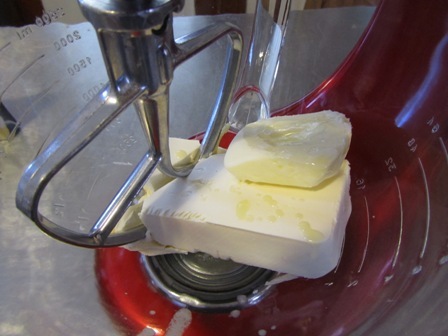 Beat cream cheese and butter until smooth. Melt the white chocolate in the microwave. Add the hot melted chocolate to the mixture. Slowly add the icing sugar. Enjoy!